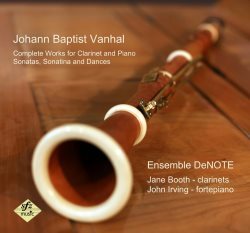 Johann Baptist Vanhal's clarinet sonatas are mostly notable for their historical value. Written between 1801 and 1810, they legitimized the clarinet as an equal partner in the sonata form. They did for that instrument what Beethoven did for the cello around the same time. Until the turn of the century, the clarinet had mainly appeared in ensembles with multiple other instruments, like the great quintets of Mozart and Weber. To be sure, there are purely musical reasons to listen to the sonatas, as well. Take the first sonata's adagio: the piano accompaniment uses the exact same triplets you've heard in Beethoven's "Moonlight" adagio, but to accompany a very different theme and create a very different mood. The second sonata, in C and using a clarinet in C, often demands comparison with Mozart. Generally speaking, the music gets better as it goes along, leading to the wonderful third work. The performers preface that sonata with a short solo piano piece, and this works so well I was actually startled. On the other hand Vanhal is not always as interesting here as he is in the symphonies. The Six English Dances for solo piano, in particular, create the impression that either the English aren't very lively dancers or Vanhal was not enjoying the taverns. For lovers of historical instruments and performance practices, this is a real treat. Jane Booth, a period clarinet expert who has played with the Orchestra of the Age of Enlightenment, Tafelmusik, and Academy of Ancient Music, selects several replicas of 1790s clarinets, in different keys and made of boxwood. They sound superb, and nobody will wish for a modern instrument in their stead. John Irving, a professor and Mozart expert who's written a stack of books, proves an able accompanist, and skilled at bringing out the colours and beauties of his piano, another replica, this time of a Walter fortepiano from around 1795. Both instruments are flattered by very good recorded sound. The excellent booklet by the performers offers extensive notes on composer, music, instruments, and performance choices, including their decision to occasionally ornament or embellish lines to create a deeper sense of "dialogue". For period-instrument enthusiasts and classical-era aficionados, this will be a real treat.